Folks living in the Tennessee hills have prided themselves on their production of Smoky Mountain moonshine for generations. Passing on recipes from generation to generation, these bootleggers and moonshines developed a craft that vacationers to the Smokies can taste at Ole Smokey Moonshine Gatlinburg. 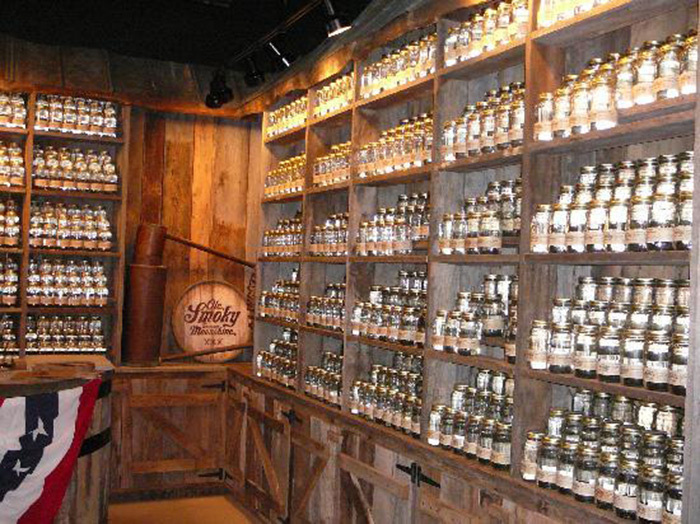 Enjoy some of the finest Tennessee moonshine around at Old Smoky Moonshine distillery. You'll taste the South in every drop of these flavorful Smoky Mountain moonshine selections. Come visit the distillery today to find out why everyone 'round here gets their corn from a jar. The Original- A standard corn mash that would make even Popcorn Sutton proud. All the corn in Ole Smokey Moonshine Gatlinburg's mash comes right from farmers in East Tennessee, so you know you're getting a true taste of the hills. Tennessee Moonshine Cherries- Each of these sweet cherries pack a pucker of Smoky Mountain moonshine. Once you've finished of the jar use the juice to create a grown-up cherry cola. White Lightnin'- Use this Tennessee moonshine as a substitute for vodka, gin, or tequila in your favorite mixed drink and see why this Old Smoky Moonshine Distillery blend is a favorite. Charred- This 105 proof whiskey is perfect for mixing your favorite Tennessee Moonshine drink. The Flavored Lightnin' Series- Coming in Lemon Drop, Strawberry, and Hunch Punch flavors, everyone is sure to love Old Smokey Moonshine Gatlinburg's twist on their classic White Lightnin'. Flavored Tennessee Moonshine- These flavors of Smoky Mountain moonshine make Old Smokey Moonshine Gatlinburg a favorite stop for Smoky Mountain vacationers. The Apple Pie flavor will take you back to Grandma's kitchen. Blackberry, Peach, Pineapple, and Watermelon flavors invoke some of the favorite fruits of summertime. And what could be more Southern than a glass of Sweet Tea Tennessee Moonshine? Come visit Ole Smokey Moonshine Gatlinburg today and enjoy a complimentary tasting with your tour of the distillery. On your tour you'll learn how they make this delicious selection of Tennessee Moonshine at Old Smoky Moonshine distillery as well as the history of moonshine. To sample moonshine, Ole Smoky Moonshine distillery now requires visitors to pay $5. In exchange, the distillery offers visitors a $5 discount coupon for your purpose, so you can sample their moonshine flavors and whiskies before you purchase them. The shop also boasts plenty of fun apparel, Appalachian food stuffs, glasses, signs, and more. There's no reason not to stop at Ole Smokey Moonshine Gatlinburg for a true taste of Tennessee moonshine. Make sure you have someone to drive a carload of rowdy mountain men and women back to your lodging safely after a tasting at Ole Smoky Moonshine Distillery (that Smoky Mountain moonshine will sneak up on you). Stay close to Ole Smokey Moonshine Gatlinburg! Enjoy your Tennessee moonshine at Ole Smokey Moonshine Gatlinburg even more when you know one of Cabins USA's Gatlinburg rental cabins rests minutes away. A cabin stay provides you with a spacious lodging with all the comforts of home that rests right next to all the action. Find a Smoky Mountain Moonshine cabin rental , like Moonshine Manor, to match the mood and enjoy a Smokies vacation filled with friends, Tennessee moonshine, and great memories.